Discover Jordan's historical sites and far-reaching desert landscapes whilst staying in comfortable hotels on this exciting journey. 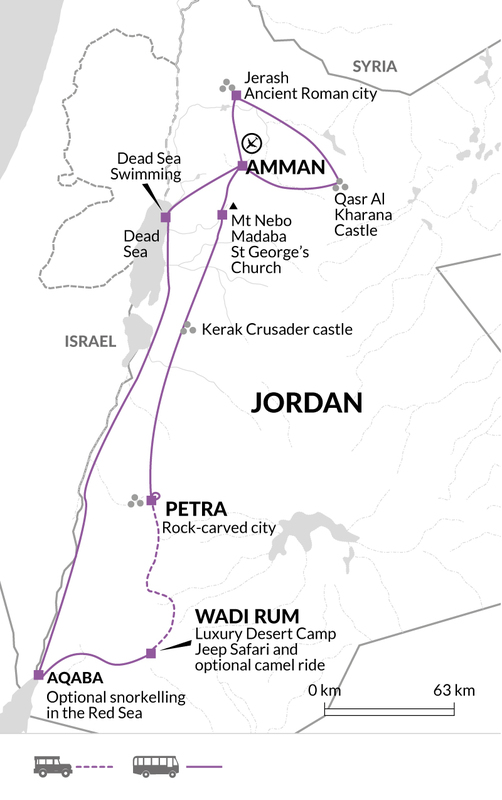 Explore the rose city of Petra, the Roman ruins at Jerash and take in the view over the Holy Land from Mount Nebo. Experience the thrill of a jeep safari through the copper-coloured sand dunes of Wadi Rum followed by an evening in a luxury desert camp. There's also time to snorkel in the crystal clear waters of the Red Sea before descending to the lowest point on earth for an obligatory float in the Dead Sea. Join the trip today in Amman. You will meet with your group and Tour Leader this evening. Today we dive straight into exploring the ancient history of this area, with a guided tour of Amman. The city tour this morning will be a combination of travelling via minibus and walking through this amazing city. The main sights will include; The King Abduallah Mosque also known as the Blue Mosque, is a landmark with its blue dome which internally is covered with Quranic inscriptions; The Citadel, situated on the city's highest hill, also includes the striking historic buildings of the Umayyad Palace and the Roman built Hercules Temple; and The Roman Theatre, a remarkable example of Roman Philadelphia, is set within the side of a hill with the capacity of 6000 seats. This afternoon we drive to Jerash and spend our time at this Middle East treasure located in the Gilead Hills. Considered to be the best preserved city of the Ten Decapolis Cities of the Roman Empire, we will spend our time roaming the ruins and walking through the iconic triple arch gateway leading onto a colonnaded street, theatre, temples and baths. From here we return to Amman for our overnight stay. We start today with a visit to Desert Castles and Palaces. Our morning tour includes Qasr Al Kharana; a castle that is believed to have been built 1200 years ago and is one of the first examples of Islamic Architecture in the region. Amra Palace; a UNESCO site, is a wonderful example of an Umayyad desert complex, renown for its amazing early Islamic art depicted throughout the many frescoes on the walls and ceilings. And Aszraq Castle, once the headquarters of Lawrence of Arabia, which he called the Blue Fortress. This afternoon we visit Madaba, a small Christian town with its collection of extraordinary mosaics, including the Great Map of Palestine (6th century). We also stop at St George's Church where the mosaic map of the Holy lands is part of this church's floor. We then investigate Jebel Neba (808m), better known as Mount Nebo. A pilgrimage centre for Christians principally because Moses is said to have seen the Promised Land from this summit. We return to our hotel in Amman. This morning we leave Amman and travel to Petra for a two night stay. Abandoned centuries ago, Petra was the rock cut stronghold of the Nabateans. Surrounded by imposing mountains and approached through a deep, narrow cleft in the rocks, known as the Siq, it is a unique and unforgettable place and, enhanced by the play of light and shadow, an altogether overwhelming experience. A guided orientation tour will take us to some of the key parts of this remarkable and ancient site. We'll take in the Colonnaded Street, the Royal Tombs and marvel at the amazing theatre, with its 8,000 seats carved from the solid rock, before a free afternoon to continue exploring at your leisure. This evening we enjoy a Bedouin cookery demonstration and meal at a nearby restaurant, learning how to make a traditional Makloubah (upside down) dish, with meat, rice and fried vegetables, followed by Um Ali, a creamy Arabic dessert with croissant pieces, raisins and nuts. Today you have a full free day at Petra. Returning to the city, you can climb steep paths to the sacrificial 'High Places' (altars) for stunning views over Wadi Araba and the Negev Desert. You might also take the high road up to the Monastery, which is the largest of Petra's monuments and certainly worth the climb up to it. Towering to a height of 40m its doorway alone measures 8m in height. We also recommend a trip to El Beidha (or 'Little Petra' as it is known) or to the excavated Stone Age village where you can see the remains of houses, fireplaces and workshops dating from around 6000BC. This evening there may be the possibility of enjoying an enchanting tour of the city by night (optional). Today we transfer to the Wadi Rum Desert. The Wadi Rum desert is an impressive sight with Monolithic outcrops of granite rock and sandstone rising out of the desert.This afternoon we have the chance to experience an exhilarating 4WD excursion (optional), that ends at the camp. After sunset, we enjoy the Bedouin hospitality around the campfire under a blanket of stars; a great setting to share stories while sipping mint and sage tea. A traditional bedouin dinner, which consists of a chicken or a goat meal cooked under the desert sand, is served as well as a delicious selection of mezze. We use a comfortable camp with great views over the desert. Each private tent retains the traditional Bedouin design, furnished with comfortable handmade beds, with electricity provided via solar power. This morning there is the opportunity for a camel trek (optional) through the dramatic Siq el Barra and learn about this precious alliance between the dromedary and the nomads. Leaving Wadi Rum later this morning we drive to Aqaba on the Red Sea coast for a chance to relax and take in the sea views. On arrival in Aqaba your Explore Leader will be on hand to arrange an optional snorkelling trip or visit to the private Berenice Beach Club (optional). We visit the Crusader Castle of Kerak this morning, imposingly sited on a hilltop. Kerak became famous during the time of the Crusades as one of a chain of fortresses in the Holy War against Islam. After visiting this magnificent castle we continue with our journey and head towards the saline waters of the Dead Sea. At nearly 400m below sea level this is the lowest point on earth. We will have time to enjoy the strange delights of floating and bathing in the skin-soothing properties of the mud as well as visiting the Panoramic Complex and Visitors Centre, before returning to the capital for our final night. Our trip ends in Amman after breakfast. Little Petra JD17.50 pp for return transportation from Petra. Wadi Rum - Camel trek JD20.00 pp. Aqaba - Snorkelling on coral reef including lunch and snorkelling kit JD35.00 pp; Snorkelling from Boat (snorkelling equipment included) JD35.00 pp; Berenice Private Beach club - entrance fee JD10.00 pp. Lightweight clothing is essential in mid- summer, with a sun-hat and neck protection, though a sweater and light jacket are advisable for Wadi Rum. Early mornings throughout the year can be very cold in the desert and winters (Nov-Mar) in Jordan can be cold, so please bring suitable warm clothing. We recommend a waterproof and windproof jacket, fleece, hat and gloves for winter. We recommend taking lightweight walking/hiking boots with good ankle support, plus trainers or sandals for relaxing and travelling in. A high factor suncream and good quality sunglasses are essential. Walking poles may be useful for steps and the walks around Petra. A personal water bottle and small torch are useful. Local Crew: Although entirely voluntary, tipping is a recognised part of life in this region of the world. Some local staff will look to members of the group for personal recognition of particular services provided. In order to make things easier for you, the Tour Leader may organise a group's tips kitty and if this is the case, they will account for it throughout the tour. Accordingly you should allow approximately JD25.00 pp (Jordanian Dinar) for gratuities for local staff. The Jordanian government levies on all travellers a departure tax of JD10.00 per person. For travellers departing by air this is usually included in the taxes on the airline ticket and thus nothing will be collected from you at the point of departure. For those travellers departing by land, this will be collected by the immigration authorities at the port of departure from Jordan.